Carlos Otero Blanco is a photographer specialized in underwater photography. He is recipient of several awards and honors from various events and competitions, including the 4th International Festival “Image of Nature” in Cuba, 2007. His solo exhibitions include De lo sublime a lo ridículo (From Sublimity to Ridicule) at Fábrica de Arte Cubano in Havana, 2014; Common In Our Thoughts at the Cuban Photographic Library in Havana, 2012; Habanastation at the Cuban Cinematheque in Havana, 2011; Dormir con… (Sleep With…) at the Cuban Photographic Library in Havana, 2010; Mar Interior (Inner Sea) at the Miramar Trade Center in Havana, 2007. In 2005, he competed in the 10th World Championship of Underwater Photography in L’Estartit, Spain. His works are part of the collections of the Cuban Photographic Library in Havana; the Hans Näder Collection in Duderstadt, Germany; the Museum of Contemporary Art in Los Angeles, California; and the Carolina Sandretto Collection in Milan, Italy. 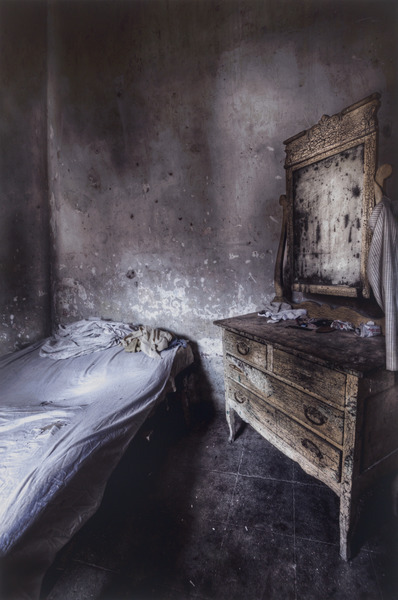 Espejo, de la serie Dormir con... (Mirror, from the series Sleep with...), 2010. Lambda print on Fujifilm photographic paper, 29 x 18 1/2 in. Ed. 13/15.